Arguably the hardest working female in the industry, powerhouse vocalist YemiAlade is set to unveil her long awaited video for her single ‘GhenGhen Love’just after recently releasing her new singles ‘Bamboo’ and ‘Show Me’. 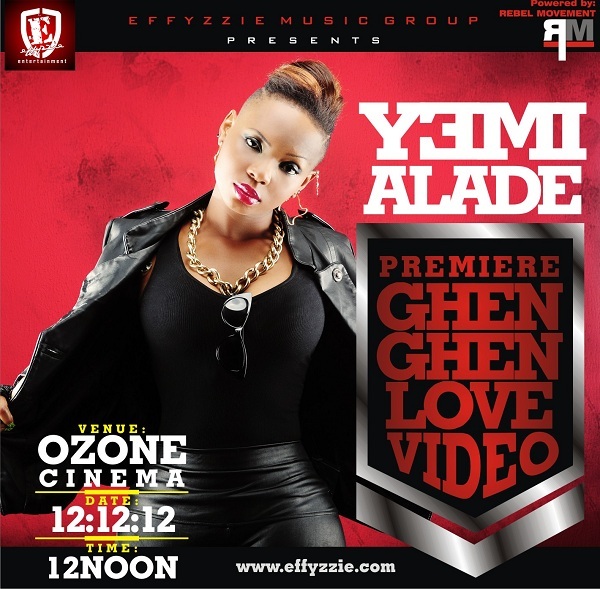 The Effyzzie Music Group recording artiste announced on Sunday that the video will be premiered at Ozone Cinemas, E-Centre, Lagos by 12:00 (GMT+1) on Wednesday, 12th December 2012. She is super excited, saying “I cannot wait for the world to see it! Hopefully I make everybody behind me proud”. The Bamboo belter will be giving away tickets for the premiere on radio and Twitter via her official account @YemiAladee. It is also rumoured that she will also premiere the Gambit Pictures directed video coupled with a mind-blowing performance at the Industry Nite on that particular day. Looking forward to connecting with fans, Miss YemiAlade will be giving out exclusive clothing pieces from Effyzzie Clothing Apparel as well as autographed CDs and other merchandize at the premiere which will have notable celebrities, heavy weight artistes, and bloggers in attendance. It must be a ritual of something because the video is to be premiered by 12noon on 12-12-12.